Hearts manager Craig Levein says it is "sensible" for managers not to antagonise supporters after Hibernian head coach Neil Lennon was hit by an object thrown from the crowd at Tynecastle. Lennon was struck during the Edinburgh derby on Wednesday after celebrating when Hearts' late winning goal was disallowed in front of the club's fans. The Hibs boss has since said he may consider his position due to the sectarian abuse he receives, which he says is because he is Irish, Catholic and both played for and managed Celtic. 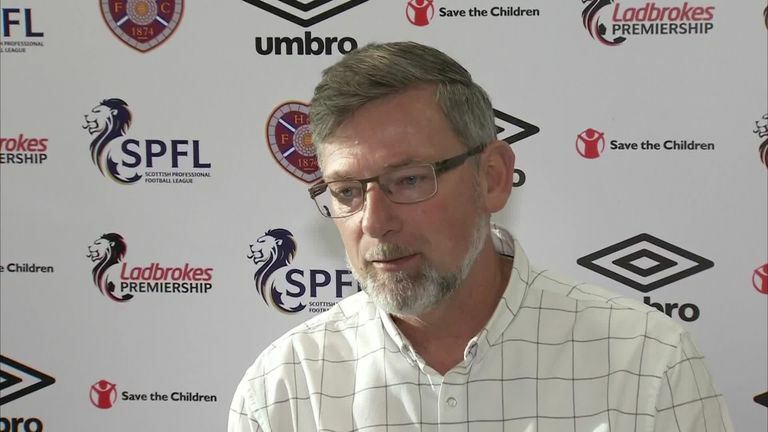 Levein condemned the treatment Lennon received at Hearts, and admitted he has also felt threatened by rival supporters. However, he urged fellow managers not to provoke opposition fans, saying: "I have been to lots of grounds where there is interaction with people behind the dugouts and it happens, it's not just at Tynecastle. "I've been spat on, called this, that and the other, and I try my best not to react. "It's on all of us to try not to react to these things, focus on the game, and not get involved with the crowd. I think that is incumbent on every manager. "The sensible approach is not to get involved and don't antagonise anybody, keep your head down and walk away. There's no winners if you get involved with people behind the dugouts." Levein says he has spoken to Lennon since the incident, adding: "I'm just glad he is okay, I actually didn't know what happened. "I thought he had collapsed, it was a real shock, but he was fine when he got up and I was chatting to him at the end of the game and he seemed okay."